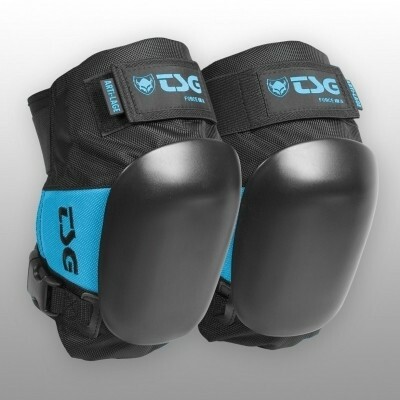 TSG Force III A kneepads are the next generation of performance vert skate pads. Based on the approved shape and comfortable fit of the Force III knee pads, it features a high performance D3O impact-absorbing pad. Boasting unique molecular properties, D3O changes from soft and flexible to an instantaneously more dense foam upon impact. The Force III Plus absorb more impact energy and greatly reduces force transmission. TSG's custom Horseshoe Shape perfectly surrounds your knees minimizing shifting and down-sliding to keep the pad in place during action. Topped with a replaceable strong PE kneecap and fine tuned with a PE reinforcement insert at the outer side for careless slides. These pads run rather big.